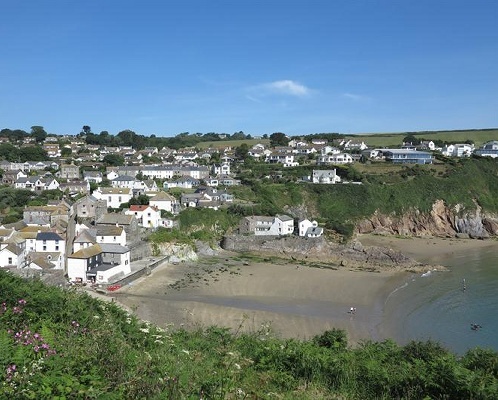 Gorran Haven is a picturesque fishing village on the South Cornwall coast. There is a sandy beach which is quite popular in summer and there is a small harbour. Signs warn of working harbour and motorised craft, swimmers to keep to the left of the buoys. Also risk of getting cut off at high tide. See Beach Safety Guide. The beach is a 5 minute walk from the car park. Final access to the beach is via a short slipway, suitable for wheelchairs. Dogs allowed all year at Gorran Haven. Dogs must be on leads from Easter day to 30th September. Gorran Haven is 8 miles from St Austell. Approach St Austell from the east or west on the A390. In St Austell on the A390 at the double roundabout turn south onto the B3273 (signposted to Mevagissey). Shortly after Pentewan turn right for Gorran Haven (signposted to Gorran Haven) and follow this road to Gorran Churchtown. Shortly after Gorran Churchtown turn right where signposted to Gorran Haven and follow this road to Gorran Haven. 1 large field car park at Gorran Haven. Beach shop at Gorran Haven.